Have you ever thought about using whey protein to increase your products’ protein content, but don’t know where to start? We can help take the guesswork out by offering you our free Dips & Spreads Applications Recipes. These recipes show you, step-by-step, how food manufacturers use our whey protein products to increase protein content in three different dip and spread applications, and provide detailed nutrition facts to show before and after nutritional comparisons. 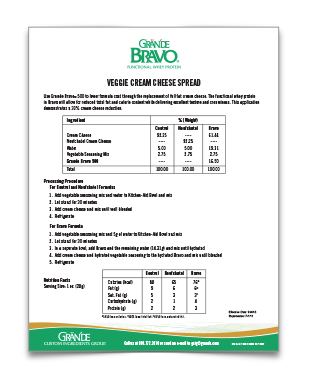 To find out more about how Grande Bravo® and Grande Primo™ can provide the protein boost consumers are looking for in your dip and spread applications, download our Dips & Spreads Applications Recipes by filling out the form.